Leaders and Legends...Out. Rutgers and Maryland...In. It's time to turn a new leaf for the Big Ten and college football. Sort of feels good doesn't it? The less things look like they did in 2013, there better I feel. Team 134, with it's uninspired 31-14 loss to Kansas State in the Buffalo Wild Wings Bowl and 7-6 record, is finished. Yesterday's news. Let's never discuss 2013 ever again. Deal? The college football offseason is less than 24 hours old, but that hasn't stopped national publications from listing their top 25 teams for 2014. And as you would assume, Michigan is nowhere to be found. Well, almost. 25. 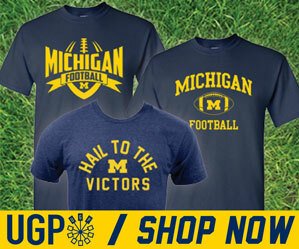 Michigan Wolverines: Michigan undershot its talent in 2013. With that young team a year older and, presumably, wiser, there is much room for improvement. Devin Gardner had an erratic year, but he is tough, has talent and is a fifth-year senior. The Wolverine offensive line, an absolute fiasco, can’t get any worse but may not get much better with Taylor Lewan leaving. Michigan’s defense should advance after a slight regression in 2013. They return just about everyone and have both veteran starters and depth. The ceiling will depend on how the second and third-year Hoke recruits develop along the defensive line. Achilles Heel: Empty rhetoric. I don't know if I agree with all of this analysis, but it's mostly spot on. Look, I know meaningless top 25 list in January are even more meaningless than the meaningless top 25 lists in August, but they exist, so let's not pretend they don't. If anything, they're simply a barometer for the state of the program and how the rest of the world views you. 1. How good you finished the previous season. 3. How good your quarterback is. *Assuming he's not being poached by a better team or the NFL. Michigan fails the eye test on all three of these criteria. Thus, they find themselves in the barren wasteland that is the unranked masses. I have to think when preseason top 25 polls come out, Michigan will be receiving votes, at best. If there's any solace to be gathered here, it's that Auburn...who finished 2012 with a 3-9 record, was nowhere to be found on these lists a year ago. They snuck up on everyone (except LSU) and blew a huge early lead to hung in with the #1 team in the country in the final BCS title game to finish 12-2 ranked #2 in the country. Michigan State in 2013? They weren't ranked until week 9. They finished #3. It would take a Brady Hoke in year 1 type of turnaround to have a Beat OSU, win the B1G and a major bowl type of season, but I'm not saying it's impossible. Michigan has the talent to get there. But that talent must be refined and further developed. That could mean possible coaching staff changes yet to be determined/announced. We will see. UM coaches who've been off since the bowl game, are back in Ann Arbor this week. Team 135 officially starts today.